Since February, 130 of the 166 detainees at Guantanamo Bay have been on hunger strike, which has now surpassed the 100-day mark. Realizing that the only way to get the world's attention to the ongoing injustice is through risking their lives, the men have finally succeeded in gaining the attention of United States President Barack Obama, as well as mainstream news outlets. The cost in doing so has been very high, as is evident in a chilling op-ed published in The New York Times. In the article, Samir Moqbel, a Yemeni detainee who has never been charged with a crime but has been detained for the past eleven years, describes the agony of being force-fed. The significance of the hunger strike is further emphasized by Shaker Aamer, a British resident and Saudi national, who like Moqbel, has also not been charged with a crime, but has been detained for the past eleven years. 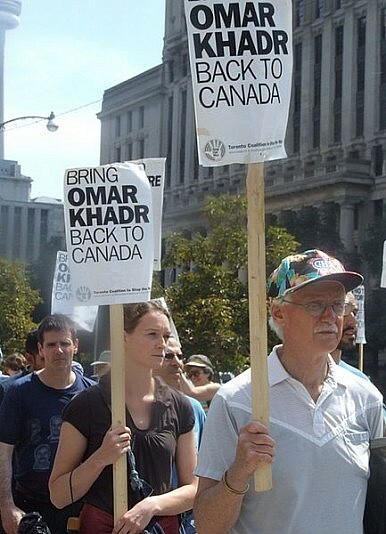 In light of the hunger strike, the Free Omar Khadr campaign is advocating for justice for the detainees. One member of the campaign, Sara Naqwi, has made a short film to bring attention to their critical condition. The campaign has been seeking freedom for Khadr, one of the youngest detainees in Guantanamo Bay, a Canadian citizen who was merely 15 years old when captured in Afghanistan. Now 26, he was detained in the notorious facility for nearly 11 years. He was repatriated to Canada eight months ago, but remains in maximum security prison. Human rights activists, Heather Marsh and Sara Naqwi, who are part of the core team of the campaign, spoke with The Diplomat about the battle to free Khadr. When and how did you get involved in Omar Khadr's advocacy? Heather Marsh: I am Canadian so I was aware of Omar Khadr's arrest as soon as the media announced it. At first, I believed like everyone else that he would of course be released immediately. It wasn't until we began hearing of the falsified U.S. documents, changed to say he was the only survivor, that I realized they had every intention of going through with a mock prosecution and keeping him there. The Canadian media completely ignores the Omar Khadr story except for their canned responses that they have been using for a decade. Heather, as a human rights activist involved in the campaign, do you think the international media has given due coverage to Khadr's case? case, but still has done a far better job than Canada. Canada's lack of response has been unprecedented in the world. Why was there not a larger public outcry from Canadians when a 15-year-old Canadian was sent to Guantanamo Bay where torture was known to be practiced? Heather Marsh: I have wondered that for 11 years. It is easy and just to blame the media’s portrayal of the case. But they have occasionally tried to present a factual account and the Canadian people are not hearing it. They are either violently opposed to Omar Khadr or indifferent. The fact that I work with people overseas on this campaign, not Canadians, is out of necessity. The majority of Canadians interested are those trying to sell a book, appear on panels, or further their journalism career. I really have no explanation for Canadians' behavior, but it is in line with their response to most human rights issues. The most heartbreaking part of this whole saga has been finding out the extent of how Canadian indifference has kept Omar where he is today, as shown in the U.S. state cables. Why was Khadr treated as a war criminal and not a minor? Heather Marsh: From the U.S. perspective they have been rewriting the law to try to prosecute these people for years. From a Canadian perspective, there is no excuse for it. Nothing he has been accused of is a war crime. Some feel he ought to be treated as a child soldier, but for me he was just a child. There is no evidence he was a soldier at all. If Canada's Supreme Court has determined the Canadian government was guilty of torturing Khadr when he was a minor, why is he still in prison? violated our charter of rights and freedoms, they did not have jurisdiction to tell the government how to remedy that. An extraordinary decision. In your opinion, do you think Khadr will eventually be released? Heather Marsh: Never without a huge outcry from the Canadian people. That is evident. There is no political will to release him from any party. Sara, how did initially hear about the Free Omar Khadr campaign and when did you join it? Sara Naqwi: I joined the campaign over a year ago and it became an integral part of my life immediately. I came across the documentary, You Don’t Like the Truth: 4 Days in Guantanamo, which contains footage of a 15-year-old Omar being interrogated by CSIS (Canadian Security Intelligence Service). It was heartrending to witness a child break down in front of three apathetic adults, begging them to notice his raw, untreated battle and torture wounds. I immediately began researching on Omar’s case in detail, learnt he was never meant to be imprisoned in the first place, and contacted groups like Amnesty International to take action. I came across our campaign group that works with Amnesty International Canada, lawyers, journalists, and professors, and began to work closely with Aaf Post, the creator of the campaign. You recently made a short, powerful video on the detainees at Guantanamo Bay. As a young activist, how important is social media today for human rights activism and in spreading social awareness? Sara Naqwi: I believe that social media is as critical in human rights activism as it can be detrimental. While campaigning for Omar, we came across several counter groups that fight against Omar’s freedom, label him a terrorist, and gather support from the ignorant, grossly abusing the concept of human rights through the platform of social media. I came across endless articles by reputable journalists from respectable media outlets that have covered Omar’s story for the past eleven years. They have chosen to portray Omar as “convicted war criminal”, as opposed to “Canadian child torture victim” who “confessed/admitted” to war crimes that, incidentally, have no bearing in International Law. Realizing the global impact that social media makes, even if it is through words that carry weight in their nuances, I’ve learnt it is crucial to be extremely vigilant about one’s sources and to read everything with a critical eye before campaigning for it, or to even pass on the information. It is a crisis situation when a young boy has been wrongfully captured and tortured, tried in a sham court, and is referred to as a “war criminal”. Even liberal Canadians will consume this as authentic data from a trusted news outlet. I’m very grateful for the education that comes with campaigning for Omar, as it has made me appreciate the responsibility of ensuring sound data. In this digital age of information overload, it is truly a challenge to authenticate data before spreading social awareness. That, for me, is more important than spreading awareness itself. What is the Free Omar Khadr campaign currently involved in? Sara Naqwi: Because Omar’s life was threatened by a fellow inmate in Millhaven Institution, he was moved to Edmonton Institution this week. As such, his safety is our first priority. When Omar was captured in Afghanistan, he was shot three times, and has shrapnel embedded in his eyes and right shoulder which causes severe pain. His left eye is permanently blind; the vision in his right eye is deteriorating. We are focused now on ensuring Omar receives proper medical care – something he never received in Guantanamo or in Canada since his repatriation – as soon as possible. Moreover, Canadians are greatly misinformed about Omar’s case and our work entails informing them through the Fact Sheet on our website and writing articles. And I am currently working on a short film that focuses on the rights that were taken away from Omar at the tender age of fifteen. Omar Khadr was captured in Afghanistan as a 15 year old and now awaits justice in Canada.